Kable tamper-resistant counter pens have a locking feature that discourages any attempt to dismantle, yet they can be easily unlocked without special tools to refill. The flexible nylon-coated aircraft cable secures the tapered aluminum pen to its matching base. The base is affixed to the counter with either tough, double-coated adhesive, or a hidden screw (Both are included). A pressure spring protects the Jumbo Jogger pen from damage. Available in black, gold and silver. 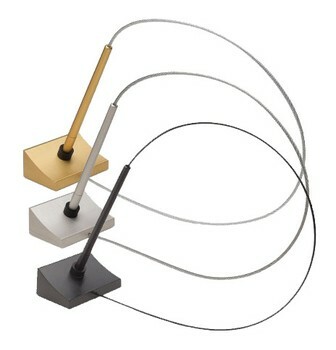 Kable tamper-resistant counter pen with locking feature. Flexible nylon-coated aircraft cable secures pen to matching base. Choice of three colors: black, gold and silver.